Camden, NJ – At the February 3, 2015 SJPC Board of Directors meeting, the agency reported its marine terminals had a breakout cargo year in 2014 with tonnage increasing by 24% over 2013 to 2,264,746 short tons. This is the second consecutive year of achieving double digit tonnage growth at the marine terminals in Camden. “Overall 2014 has been a very good year and 2015 is showing some very positive trends,” said Kevin Castagnola, chief executive officer and executive director of the SJPC. Steel imports lead the way with a 65% increase over 2013 to 900,097 tons. 2014 began with a first quarter import steel tonnage record. That trend accelerated in late 2014 with and 124,549 tons of steel unloaded in December – more than double December of 2013. Total import steel tonnage for 2014 is a new record for the Camden terminals, beating the 1997 mark of 752,542 tons. The rise in steel imports reflects a growing reliance on the SJPC’s marine terminals by shippers of steel from Europe to the American industrial heartland. “It’s a combination of the diminishing efficiency of the Saint Lawrence Seaway to the Midwest and the SJPC having the right facilities, skilled staff and rail and highway infrastructure to move these high quality rolls to steel quickly, timely and in the most cost effective manner,” explained Castagnola. The SJPC has seen its overall break-bulk cargoes increased 47% to 1,104,521 tons with scrap metal tonnage growing by five percent to 522,380 tons, cement tonnage increasing by 13% to 371,678 s/tons, salt doubling to 137,622 tons. Import cocoa beans grew by 9% percent to 66,036 tons. In 2014, the SJPC’s marine terminals handled 157 ships compared to 145 in 2013 and the number of ship days (i.e. the number of days a ship is loading or unloading at its terminals) increased from 385 to 474 – a 22% increase. 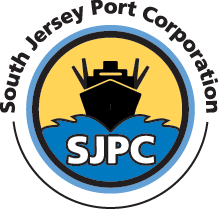 The South Jersey Port Corporation is an agency of the State of New Jersey overseeing the import and export of international bulk, breakbulk and container cargos into and through South Jersey. The agency owns, operates and manages the Balzano Marine Terminal and the Broadway Terminal in Camden, NJ and the Salem Marine Terminal in Salem, NJ and is developing a new port facility, the Paulsboro Marine Terminal, in Paulsboro, NJ. The agency is also the grantee for Foreign Trade Zone #142.